We have in-house precision gear hobbing machines which can hob as minimum as 0.3 module to a maximum of 3.0 module over a range of materials. The maximum diameter of the blank that can be hobbed is 200mm for 3.0 module. We can hob SPUR, HELICAL, BEVEL, and WORM profiles gears. With the help of the Mitutoyo instruments for Gear Metrology, we are able to confirm the gear tooth measurements to the design/drawing. 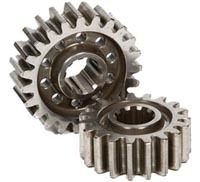 Apart from the gears for our internal consumption, we offer to undertake job work for gear hobbing. All types of turning and milling operation machining of the raw materials for our components are executed on CNC machines. This enable us maintain the quality and assembly schedule of our sub-assemblies & products. We wish to undertake CNC Turning & CNC Milling operation job work.